Super Hero Boy: A pet you don't have to clean up after! A pet you don't have to clean up after! If your looking for a small gift, a really cool stocking stuffer (though in the package I dont know if it would fit in a stocking but out it would), or just something really cool for any of the kids on your gift list Meebas are fabulous! Meebas are a electronic pet, very similar to the little key chain pets that were very popular a few years ago that have a really cool secret! 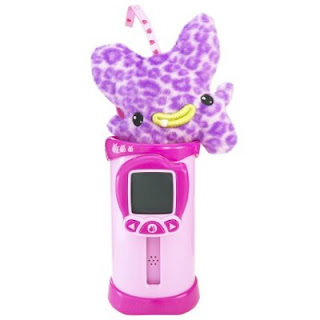 The Meeba has a little lcd screen on the front that you use to play with and care for your pet. Instead of feeding your Meeba, all the Meeba wants from you is to play. Play games with your Meeba and it will grow.. and grow.. and finally the real secret is revealed the top of the Meeba's tube pops open and the plush version of your pet is revealed. I know your thinking well what do you do once the top pops off... well you can still play games with your electronic Meeba just as you did before but now the fun is double as you can play with the plush version as well. It's a surprise as to which Meeba is in the tube so those that are lucky enough to have multiple Meebas can trade the plush versions with friends, collect them, and try to guess which Meeba they will get in their next tube. The only disadvantage to all this fun is depending on how much your child plays with the Meeba it could take weeks to pop them out.. or days. Personally I was able to get mine out in less than 24 hours and though its still fun to play with the Meeba after he has hatched it does ruin the surprise a little as part of the fun is waiting for your Meeba to pop out. So with that said the only thing I would change about this toy is that the rate of "hatching" was slowed down quite a bit though I realize for younger children it could take them weeks even at this rate. Meebas are very inexpensive if your looking for a small gift or stocking stuffer for someone on your gift list or just working on a budget this holiday season. They come in several varieties that reflect the personality of the Meeba inside, friendship, love, intelligence, happiness and are usually priced under $30 per Meeba. You can pick up a Meeba at any major retalier or toy store and I know they are available on Amazon as well! Learn more about Meebas and see some videos of the games that you can play at the Meeba's website!